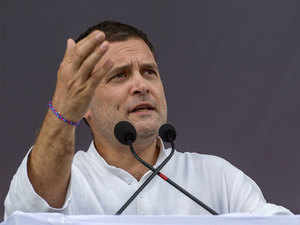 Congress President Rahul Gandhi said here Friday that his party will grant special category status to Andhra Pradesh if voted to power in the upcoming general elections. "We will give special category status to Andhra Pradesh. It's the first thing we will do after coming to power in 2019," he had told the workers. Dubai: Congress President Rahul Gandhi said here Friday that his party will grant special category status to Andhra Pradesh if voted to power in the upcoming general elections. Gandhi, who is in the UAE on a two-day visit, addressed a gathering of Indian workers at the Labour Colony in Dubai. "As soon as our government comes to power, we will give special status to Andhra Pradesh," Gandhi said. Andhra Pradesh was bifurcated into Telangana and the residuary Andhra Pradesh State on June 2, 2014. "You helped India, Indian states and the poor people and you worked to make this city of Dubai, which is great in the whole world. I want to say thank you heartily," he said. Hailing the development of the UAE, Gandhi said all the "massive developments you see here, tall buildings, large airports and metro, wouldn't have been built without your contribution". "You have given your sweat, blood and time for the development of this city and you have made Indians of all backgrounds proud," he said. Gandhi reiterated what he told a group of party workers protesting at Jantar Mantar in March last year for Andhra Pradesh's special status. "I am confident that if we stand together we will convince the Government of India and Prime Minister Narendra Modi that what is due to the people of Andhra Pradesh should be given to them," he said. The general elections are due to be held between April and May this year.